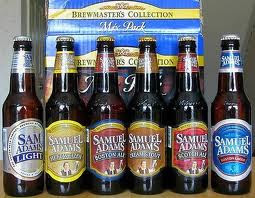 From Huffington Post, an interesting story about a battle of the breweries in which Boston Beer Company (maker of Sam Adams beer) is suing Anchor Brewing (maker of Anchor Steam beer) over allegations of employee poaching and misappropriation of trade secrets. Boston Beer executive Judd Hausner left Boston Beer earlier this year for Anchor. Boston Beer claims that just before leaving its employ, Hausner attended high-level meetings about Boston Beer's internal strategies. Boston Beer defines their particular market at the "better beer" category that makes up 20 percent of total domestic beer consumption, as opposed to the "mainstream domestic beers" which comprise the other 80 percent. Anchor claims its products are instead in the "craft beer" category, which only makes up five percent of the total domestic market, and therefore isn't a direct competitor with Sam Adams. The case is proceeding in Massachusetts, not in California where Hausner worked managing distribution in Marin, Napa and Sonoma counties. (Do they drink anything other than wine there?) Massachusetts is a lot more friendly to non-compete cases than California. Choice of law issues are likely to be paramount and we'll try to keep you in the loop on this one.